Really our summer "break" won't be a time of no-school. The kids know that. We just won't be following a schedule, and I'll be aiming for interest-led activities and reading. I'm going to take the summer break time to prep for the next year. Having been through one year of schooling with Sonlight, I have an idea of what I want to do to add to next year's work, and how I might go about preparing for that. Big plans, I tell you! Break for us won't be all that long, really - I'm aiming to start up our lessons again in mid-August, so we're looking at a 6-8 week break instead of the 10-12 weeks that the rest of the kids in our neighborhood will get. I'm okay with that, though. I think there are benefits to year-round schooling, but that's a whole other post. The break in the middle will probably be hardest for ME to come back from, since it means I'll have to get back to so me semblance of daily schedule. But it's all fun. How can it not be with my sweet 3 kids? I'm excited about our new tumbling composter! The title if the post says it all. I finally got a tumbling composter! 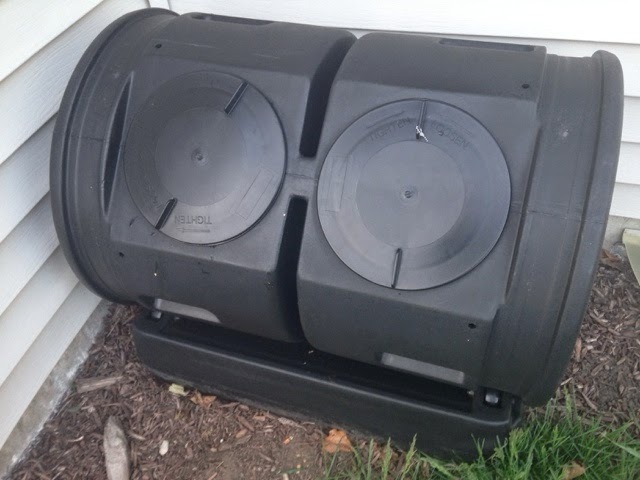 It's a dual chamber composter, placed against a wall with southern exposure. I have experimented with composting back at the yellow house, but it was a cold pile, and it never really did what it should. It was good at growing viney weeds. I'm VERY excited to be putting our fruit and veggie waste to a good use. It makes me feel a little less guilty about the veggies that end up languishing in the fridge, or freezer-burned to uselessness. The kids are excited about it, too and get a kick out if turning it. We will see how long that lasts! I'm pleased at how well our homeschooling adventure is going this year. After a year or two of feeling overwhelmed by alllll the choices and pathways for homeschooling, we decided to just... BUY a complete curriculum! (GASP!) 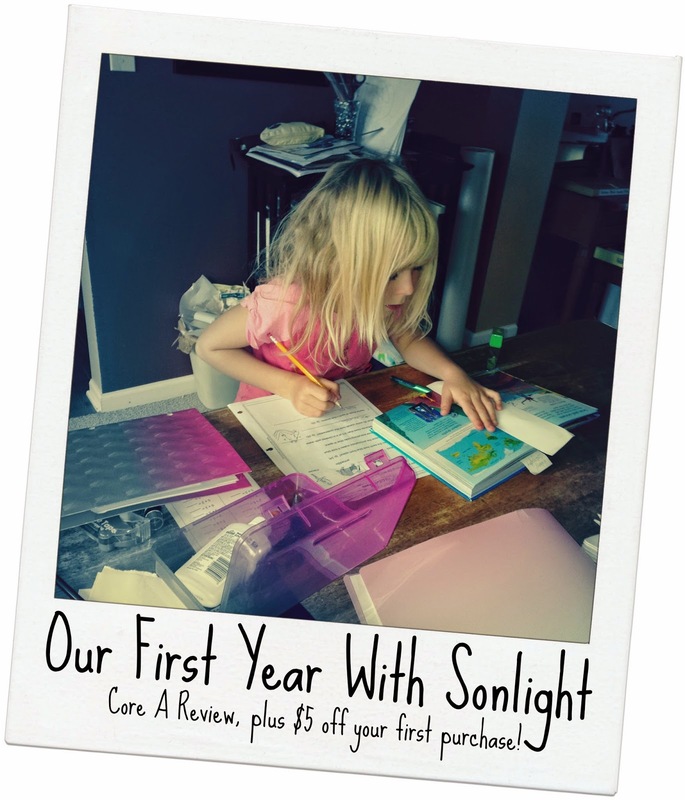 We opted to go with Sonlight this past year, and I can't express how happy I am that we purchased a curriculum. We've just finished week 30 of Sonlight Core A. With Core A, we purchased Sonlight's Language Arts 1, and Science A. We opted for Handwriting Without Tears, and Singapore Math Primary Math 1A/B For Elizabeth. I'm using this Core for both my 4/5 year old and my 6/7 year old. While the 5yo doesn't sit through all of the reading, he does listen in on much of it while playing, which is fine by me. We aren't doing any particular Language Arts or Math curriculum with him, although he plays with Starfall.com and a Hooked on Phonics app. We do use Handwriting Without Tears Pre-K workbook, which is a good fit for us. Even the toddler is learning letter shapes and sounds! We definitely don't follow the schedules as printed, but it's not intended to be a strict "this way only" kind of schedule. I would say that we tend to "clump" things, especially with the read alouds. So, rather than reading one bit of this and that each day, we'll read most of the assigned reading for the whole week for a particular book in one sitting. I'm totally fine with adapting it to fit us. So, here's a little first year review of the materials. The sing along bible verse CD. Listened to it once, and didn't care for it. We don't do scripture memorization. The Timeline Book is hit or miss - like, once or twice we've used it. I just tend to forget it. Oh well. The Giant Map. I'm okay with not having purchased this, since we use our globe and the smaller maps. The Critical Thinking book. I bought it as an extra, but for whatever reason, just never quite fit it in. I'm thinking to try to start in with it eventually, or as a summer activity. The Calendar/Coloring book. We use a big wall calendar with numbers. And there are lots, and lots of free calendars to find to help kids play with calendars. The Science material. Reading and worksheets are fine, but the timing of the experiments is just kind of off for us. I think we've done... maybe half of the experiments so far? Otherwise we just watch the DVD and read the book. I'm okay with skipping some of these things since we do a fair amount of science outside the scheduled stuff in the material. I think we will go ahead and get Science B, though, because it seems to hit the mark for us in balancing the presentation of commonly accepted theories of a very old earth/universe while allowing space and information to present a creation-based view. The Handwriting Without Tears Sonlight Schedule. Why Sonlight schedules it the way they do is a mystery to me. They spread the use of the workbook out over the course of 36 weeks, while the suggested schedule from the publisher uses the workbook in 18 weeks, and then does weekly review for the rest of the year. That makes a whole lot more sense to me, since the child builds the proper handwriting techniques early on, rather than reinforcing bad ones for longer. Language Arts 1 is probably the right fit for Elizabeth. She speeds through the reading. She taught herself to read last year using Starfall.com, so the phonics and sight word lessons she breezes through. I can't really say if it's a good method for teaching reading, or not. I think it is SPOT ON for her writing and creative thinking. We supplement with a separate journal in which she can free-write about writing prompts. We hadn't worked much on handwriting in previous years, so the copywork in the LA is a great regular practice. Using the HWT schedule for the workbook has given her good practice in learning to shape letters. For a while, handwriting was her least favorite task, but her writing improved significantly in the first 10 weeks. I've learned that it's better to do handwriting early in the day before she gets tired. Math - we were plowing through the lessons for a while, but we got into subtraction and realized she didn't really have a handle on her addition math facts within 10, and that she was just not getting subtraction, so we paused for several of weeks to play math games on the Ipad (like this), doing flashcards and doing things like coloring worksheets to help her practice her math facts. I wish that number bonds were something she really connected with, but alas, it's not, so math fact memorization it is. I borrowed a teacher's manual, and I'm glad I did. It's given me different ways to introduce the concepts that are displayed in the textbook. I don't refer to it every day, or even every week, but I think it's worthwhile. I'm generally satisfied with the curriculum. I LOVE the selection of books, and the opportunities they give to talk about hard, but real life issues. I'm finding a love of Usborne books (they use several for the main texts). I'm not sure how I'll manage running more than one Core in the future, but that's a couple years off, assuming I even stick with Sonlight. But for now, this is just what I needed to get my feet under me, and to have a guide with which to work. I sometimes long to be more interest led, but I can be so bad about following up or getting into the moment that going unschooled would not be good for us. Overall, I'm pleased with Sonlight. It's just what I needed to pace lessons so I don't overwhelm the kids with my need to get everything done right now. Make sure my referral code (CV20348267) is in the proper field when you sign up for a Sonlight Account, otherwise you won't get your $5 discount! a) not dealing with postpartum depression has been. b) having a curriculum with a clearly laid out schedule has been. So, because, I've been focusing so much on figuring how how to do this homeschool thing, and on being a advocate for the licensing of homebirth midwives in Illinois, I have been sorely lacking in time for blogging. I guess really, most of my internet energy has shifted to brief posts on Facebook, since it's nice and easy to keep up with family and friends there. I've even considered taking down the blog entirely, or at least turning it private. I'm increasingly aware of how public and permanent our digital presence is, and feeling like maybe I should ditch it. Well, at least scale it back. I know I can't undo what's been posted, and maybe I don't really want to undo it, but it's given me pause to consider: what is my purpose in having a public presence on the internet? I don't have any clear answers to this. My blog's focus (if it ever had one) has shifted around as my life has changed. So, the blog languishes, and I find myself wonder what to post, or not. But we're still here, still surviving, and possibly even thriving.